"I am leaving you all my journals, but you must promise me you won't look at them until after I'm gone." This is what Terry Tempest Williams's mother, the matriarch of a large Mormon clan in northern Utah, told her a week before she died. It was a shock to Williams to discover that her mother had kept journals. But not as much of a shock as it was to discover that the three shelves of journals were all blank. In fifty-four short chapters, Williams recounts memories of her mother, ponders her own faith, and contemplates the notion of absence and presence art and in our world. When Women Were Birds is a carefully crafted kaleidoscope that keeps turning around the question: What does it mean to have a voice? 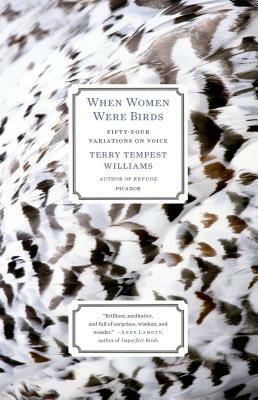 Terry Tempest Williams is the award-winning author of more than a dozen books, including Refuge: An Unnatural History of Family and Place, Finding Beauty in a Broken World, and When Women Were Birds. Her work has been widely anthologized around the world. She divides her time between Castle Valley, Utah, and Moose, Wyoming.